With a sister who is gluten-intolerant I have tried a decent amount of gluten free cookies. And let’s face it- they either have weird ingredients or they just don’t taste that great. Except for peanut butter ones. But what if you want a normal, chewy chocolate chip one? It’s a sad day for you….until now. The writing convinced me…I should try this one. I served them at a party and no one knew they were make with Chickpea Flour. Except for my sister and her very happy tummy. I literally was blown away. I wish I had of taken a picture of her face when she ate her first real cookie in YEARS. But then my brain got to going, what if I took the base of the recipe and made it my own. So yesterday my sister and I decided we needed cookies for a trip we are taking this week to Spain. Traveling without being able to eat gluten is.a.pain. Do you know that a ton of chips have gluten in them?!?! And granola bars, and candy, also most soy sauces….it’s been a rough week in the “this has gluten in it too!” department. We started with the base recipe from “A Thought for Food” and added coconut, coconut extract and left the chocolate chips. Chewy, happy, amazing smelling cookies emerged from the oven. It helped us get over the “whyyyy does everythinggggg have gluten in it!” blues. Cuz you can’t be sad while eating one of these little guys. If you skip steps in this recipe, the cookies will turn out differently, I learned this the hard way. **Don’t skip sifting the chickpea flour. This step makes the difference between cakey, hard cookies to chewy amazing ones. Sift chickpea flour, salt, baking soda, and powder into small bowl. 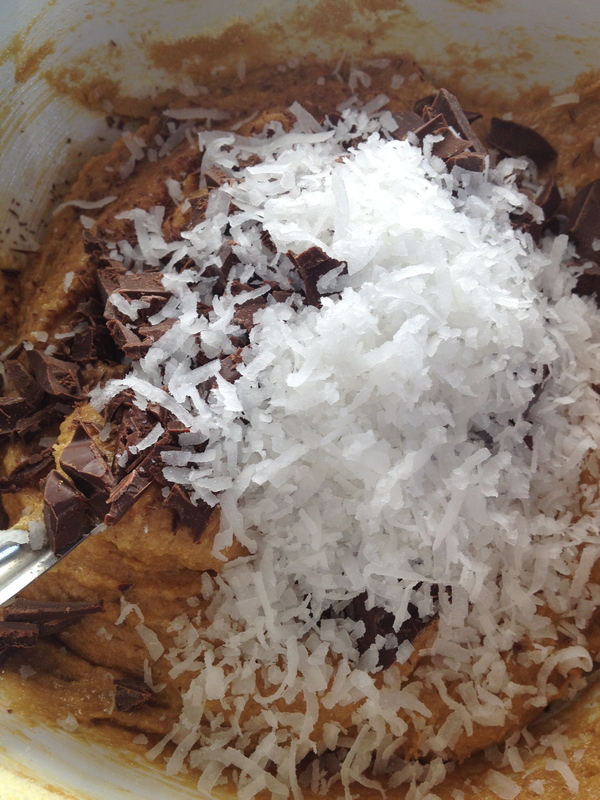 In a separate bowl, combine softened butter, sugar, vanilla and coconut extract and eggs. Mix until combined, and the butter and sugar have fluffed up a bit. Stir in the flour mixture and then add in chocolate chips and coconut. Let the dough rest in the freezer for 10-15 minutes. 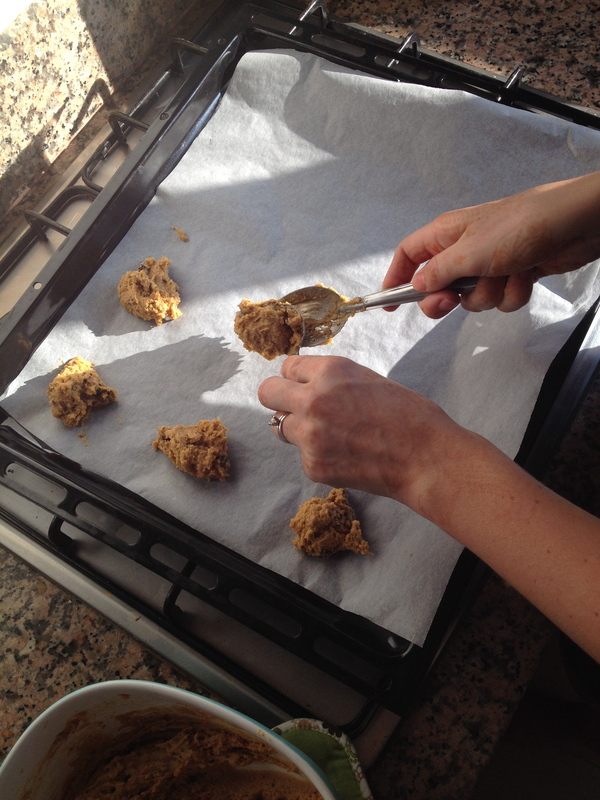 Cookies will be dark brown, and need to cook completely or you will be left with the raw chickpea flour taste. You don’t want that. The way I generally test my cookies is by watching them, when the middle stops bubbling and lays flat, they are done. Remove from oven and let cool before removing them from baking sheet. Eat, smile and fall in love with chickpea flour.